Last week the US Senate voted to do away with broadband privacy rules that prevent ISPs from selling subscribers' internet browsing histories to third parties. Congress followed suit yesterday, with a 215-205 vote in favor of repeal. But as the news sinks in, US citizens are apparently considering counter-measures, with searches for VPNs quickly going skywards. In a blow to privacy advocates across the United States, the House of Representatives voted Tuesday to grant Internet service providers permission to sell subscribers’ browsing histories to third parties. 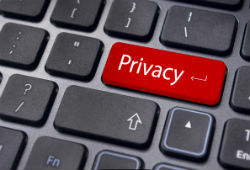 The bill repeals broadband privacy rules adopted last year by the Federal Communications Commission under the Obama administration, which required ISPs to obtain consumer consent before using their data for advertising or marketing purposes. The House of Representatives voted 215-205 in favor of overturning the regulations after the Senate voted to revoke the rules last week. President Donald Trump’s signature is needed before it can go into law but with the White House giving its full support, that’s a given. “The Administration strongly supports House passage of S.J.Res. 34, which would nullify the Federal Communications Commission’s final rule titled ‘Protecting the Privacy of Customers of Broadband and Other Telecommunication Services’,” the White House said in a statement yesterday. If that happens, the US will free up the country’s Internet service providers to compete in the online advertising market with platform giants such as Google and Facebook. Of course, that will come at the expense of subscribers’ privacy, whose every browsing move online can be subjected to some level of scrutiny. While supporters say that scrapping the regulations will mean that all Internet companies will operate on a level playing field when it comes to privacy protection, critics say that ISPs should be held to a higher level of accountability. Whereas consumers have a choice over which information can be shared with websites, browsing history via an ISP is total, potentially exposing sensitive issues concerning health, finances, or even sexual preferences. With this in mind, it’s no surprise that US Internet users are beginning to realize that everything they do online could soon be exposed to third-parties intent on invading their privacy in the interests of commerce. Predictably, questions are being raised over what can be done to mitigate the threat. Aside from cutting the cord entirely, there’s only one practical way to hinder ISPs, and that’s through the use of some form of encryption. Importantly, visitors to basic HTTP websites will have no browsing protection whatsoever. Those using HTTPS can assume that although ISPs will still know which URLs they’ve visited, content exchanged will be cloaked. As a result, various providers, including blackVPN, ExpressVPN, LiquidVPN, StrongVPN and Torguard, have weighed in on the debate via social media. 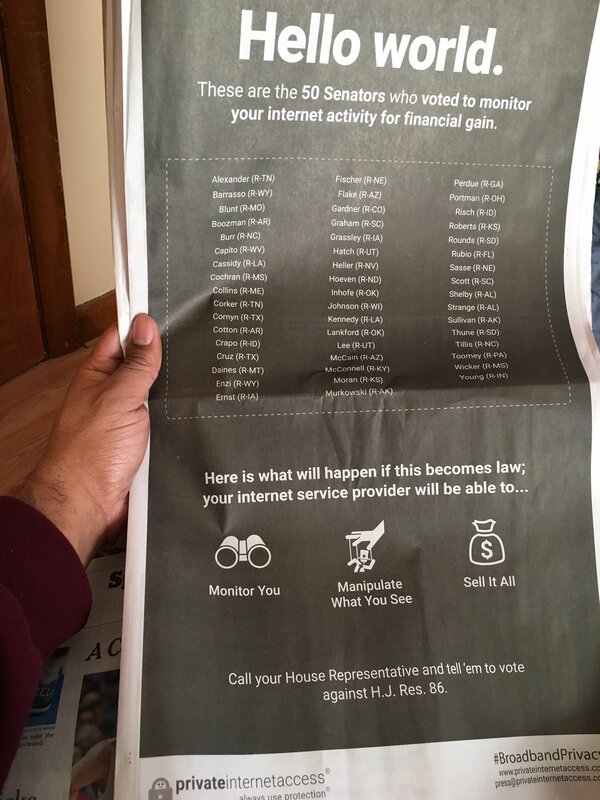 NordVPN have also spoken out against the bill in the press, and Private Internet Access even took out a full page ad in the New York Times this week. It’s now becoming clear that while it was once a somewhat niche activity, VPN use could now be about to hit the mainstream. Taking a look at Google Trends results for the search term ‘VPN’, we can see that interest across the United States is now double what it was back in 2012. The significant surge to the right of the chart is likely attributable to the past few weeks of debate surrounding the repeal of broadband privacy rules. While most VPN providers have been campaigning against the changes, there can be no doubt that the signing of the bill into law will be extremely good for business. As seen from the above, record numbers of people are learning about VPNs and there’s even encouragement coming in from people at the very top of Internet commerce. Following the vote yesterday, Twitter general counsel Vijaya Gadde took to her company’s platform to‏ suggest that citizens should take steps to protect their privacy. Her tweet, which was later attributed to her own opinion and not company policy, was retweeted by Twitter Chief Executive Jack Dorsey. It will be interesting to see how the new rules will affect VPN uptake longer term when the fuss around the debate this month has died down. Nevertheless, there seems little doubt that VPN use will rise to some extent and that could be bad news for copyright holders seeking to enforce their rights online. In addition to stopping ISPs from spying on users’ browsing histories, a good VPN also prevents users being monitored online when using BitTorrent. A further handy side-effect is that they also render site-blocking efforts useless.